Two weeks ago, the Asociación Campesina del Valle del Río Cimitarra (ACVC) received Colombia’s National Peace Prize. This is an unprescedented formal recognition of the ACVC’s work defending human rights and organising farmers around issues of food sovereignty and land rights. PBI has formally accompanied the ACVC since 2009, and travelled with them to Bogotá for the award presentation. Kyla Sankey, a PBI volunteer from the UK shares her reflections from the night (en español más abajo). Members of the ACVC have suffered stigmatisations, threats, baseless prosecutions, imprisonment and many have lost their lives. In this context, the National Peace Prize represents a very important achievement for the ACVC: the recognition and legitimisation of their cause, as well as a useful tool in the current negotiations for lifting of the suspension of the Peasant Farmer Reserve Zone (Zona de Reserva Campesina, ZRC). Throughout the day we could feel an atmosphere of satisfaction and, as always with the ACVC, solidarity. When we arrived in Bogota we went to the office of the organisation Reiniciar, where we were greeted with a reception of food and drink, and each member of the ACVC made a toast. I remember that as we sat waiting for the award ceremony, Miguel Huepa, one of the regional coordinators, chatted with me about the crops of Colombia, the type of land needed for growing plantains and cassava, how collective farming systems work, and the colloquial expressions of the countryside. In 2008 Miguel was imprisoned for 17 months. A week after his detention his son was murdered. 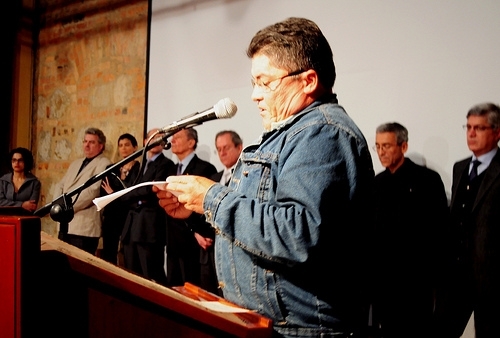 It was Miguel who spoke for the ACVC in the award ceremony, a powerful speech about the peaceful mobilisation of peasant farmers against paramilitary forces in the area, the struggle for rural development, and calling upon the government to lift the suspension of the Peasant Farmer Reserve Zone of the Cimitarra River Valley. Finally, he called for the government to reopen peace negotiations with the FARC-EP and ELN. The audience was moved, and there was a loud applause when 30 members of the ACVC went on stage to receive the prize. That evening we had dinner, with live musical performances from Miguel Huepa, Annye and Monica from the ACVC before going back to Barrancabermeja. That same evening the ACVC received a letter of congratulations from the Minister of Agriculture, from whom they are still waiting for the official announcement to lift the suspension of the Peasant Farmer Reserve Zone. Previous PostHuman rights defender jailedNext PostWho can lock up a smile? This past week, here in Canada, we did meetings with parliamentarians and civil society groups. In those meetings we did profile the work of – and the threats that ACVC have received because of their work. It is good news that ACVC has won this award.